I love music. I love Yoga. Should I keep these personal passions separate if I am to teach authentically? Not necessarily so. 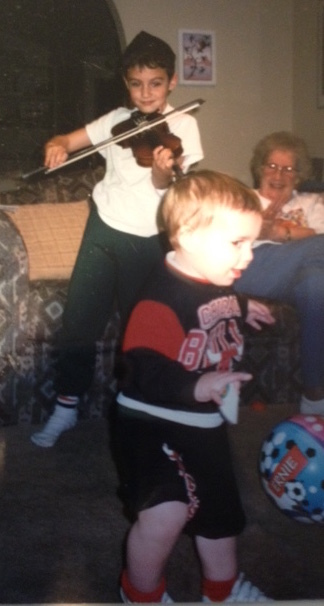 Note Jesse’s joy as he dances, Grandma’s pleasure as she watches, and big brother Sam’s pride as he fiddles. Let’s start with some distinctions. In this post, I’m speaking of asana (the physical practice of yoga). Meditation, pranayama (breath practices) as well as savasana the final relaxation pose in my classes are guided sans external soundtrack. The style of music I am referring to is calming, soothing, or inspiring for most people. If there are lyrics, the words are associated with values congruent with the yoga tradition. Music & Yoga: Yes, No, or Maybe? Yoga teachers hold various opinions about playing music in class. My most influential teachers and mentors do not play music. And I have loved their classes. I believe it is because they are teaching from their deeply authentic space, and perfectly valid belief that we have plenty of outside auditory distractions “in the world”. It works because they teach from who they are. In classes, I frequently choose to play carefully chosen music that sets up an environment of healing and calm during asana. Through years of trial and error, I have found selections that speak to both me and my students; and I’ve removed selections that are less than optimal for asana. 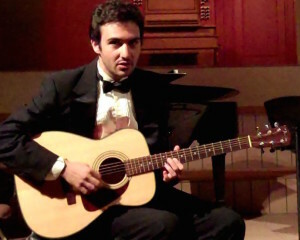 Sam at his senior music composition recital. He created a relaxing classical playlist, some selections shared below. Ultimately, music and movement make lovely dance partners! In prenatal yoga classes, I particularly recommend that students identify music that helps them feel relaxed. When in labor, or when the stresses of early parenthood are at their peak, familiar, calming, and comforting music can play a role in stimulating relaxation. As proven, we perceive relaxing sounds and our bodies minds brains relax. Ahhh. Indeed, music therapy is a clinical and evidence-based profession. A music therapist is a highly specialized expert holding a degree providing skills to work with patients in a myriad of settings. For example, music therapists support children prior to surgery, brain injury patients, Alzheimer’s patients etc. The stress management classes I taught for decades were not group therapy, however therapeutic healing results did occur as my students employed the tools of stress management. The same potential holds for music in yoga classes. Therapeutic calming, stress reducing effects can happen with music selections compatible with the yoga practice. I’d like to share a few of the albums I find relaxing. My students have asked me numerous times for this list. This is for you, with love. Journey to the Heart My all time favorite. Out of print however many pre-owned available. Putumayo Presents Yoga Lovely variety. What are some of your most calming musical pieces? I’d love to hear from you. Looking forward to seeing you in class!